Use this vanity to bring more traditional style into your bathroom. Its beige tan marble counter and white solid wood base are very easy on the eyes. Bring a classic look and feel to your bathroom with this beautiful set from Wyndham Collection. Bring a fresh, traditional look into your bathroom with this vanity. With a beige tan marble counter and white solid wood base, this piece is very stylish. Made with a roomy double-door cabinet and drawer, this vanity has lots of room to keep items like toothpaste, towels, and hair brushes. Put together your perfect bathroom with this stylish vanity set from Wyndham Collection. For a bit of traditional style in your bathroom, choose this beautiful vanity. Its beige tan marble counter and white solid wood base will look beautiful in your home. Make your bathroom look like new with this good-looking, useful set from Wyndham Collection. This vanity has both an all-around look and a traditional style. Its beige tan marble counter and white solid wood base will look beautiful in your home. Put a nice touch on your bathroom's look with this vanity set from Wyndham Collection. Designed with a traditional style and strong build, this vanity is a perfect choice for any bathroom. Made with a special white solid wood base and a beige tan marble counter, this piece will make your bathroom look even nicer. This classic set from Wyndham Collection will make your bathroom look brand new. 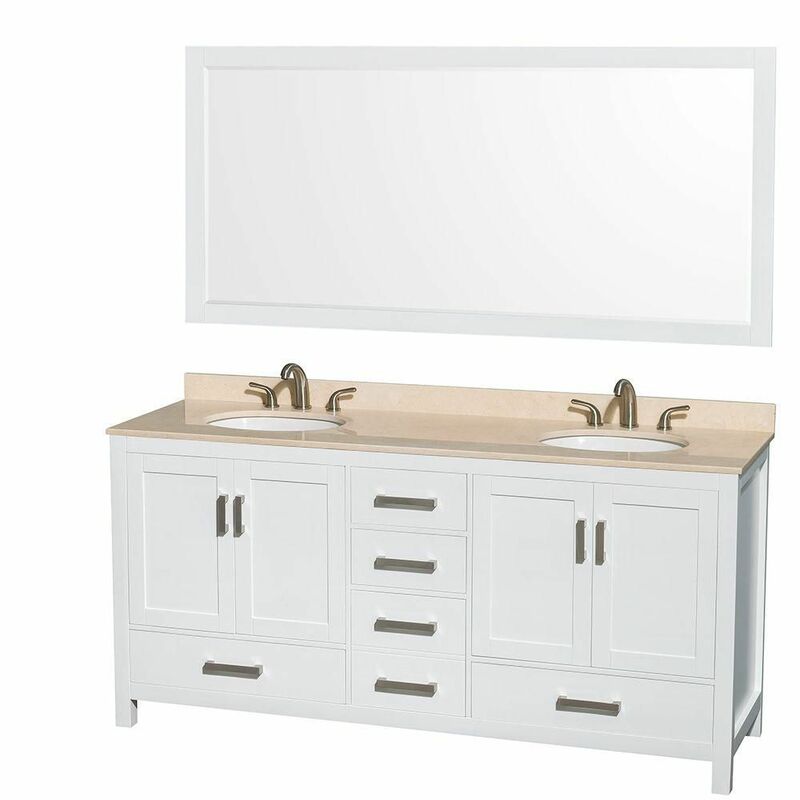 Sheffield 72-inch W 5-Drawer 4-Door Vanity in White With Marble Top in Beige Tan, Double Basins Use this vanity to bring more traditional style into your bathroom. Its beige tan marble counter and white solid wood base are very easy on the eyes. Bring a classic look and feel to your bathroom with this beautiful set from Wyndham Collection. Sheffield 72-inch W 5-Drawer 4-Door Vanity in White With Marble Top in Beige Tan, Double Basins is rated 4.0 out of 5 by 2. Rated 3 out of 5 by Paul from The vanity is well made (except on door was not quite lined up and the contractor has to made adj... The vanity is well made (except on door was not quite lined up and the contractor has to made adjustment to close the door without rubbing into each other). It was well packed for delivery as well. However, there are a few things I wish Wyndham (the manufactures?) listen to its customers... for God's sake, make a matching side splash!!!!!!!!!!!!!!!!!!!!!!!!!!!!!!!!!!!!!!!!!!!!!!!!!!!!!!!!!!!!!!!!!!!!!!!!!!!!!!!!!!!! - Why in the word do you make vanity marble top but did not make a matching side splash. I thought it was not included with the purchase but I would have an option to buy ones after the fact, If I know that Wyndham did not even make the matching side splash before installing it, I would return it. Now, I have to look for after market side splash and it is not going to match, it will be ugly to say the least. For that, I recommended this Wyndhm Collection Sheffield 72" Double Vanity with reservation. Buy it if you don't care about installing a side splash. Rated 5 out of 5 by deetour from This unit is a beautiful piece of furniture. It took my old dated 80's bathroom into this century... This unit is a beautiful piece of furniture. It took my old dated 80's bathroom into this century. It is heavy duty and very well made. You will need two strong people to lift the sinks/countertop onto cabinet. It is extremely heavy. It arrived on time and undamaged. I could not be happier with this purchase. I have so much storage now in the bathroom and it looks elegant.